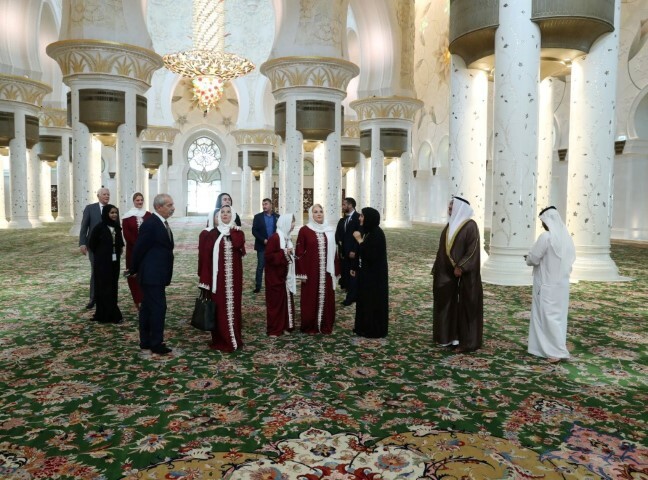 ABU DHABI, 17th October 2018 (WAM) - Viorica Dancila, Prime Minister of Romania, accompanied by Ahmed Abdullah Al Matroushi, UAE Ambassador to Bucharest, visited Sheikh Zayed Grand Mosque on Wednesday. The Romanian Prime Minister and her accompanying delegation were guided through the tomb of the late Sheikh Zayed and briefed on the unique leadership qualities, embodied by the nation's Founding Father, as well as on the Islamic architecture and history of the mosque, which plays an important role in promoting intercultural communication and enhancing the culture of tolerance and peaceful co-existence among peoples across the world. At the end of the visit, Prime Minister Dancila was presented with a copy of the book, "Spaces of Light", published by the Sheikh Zayed Grand Mosque Centre.